Expedia has some Montpellier packages ready for you. Combining your accommodations and flights is one of the most straightforward ways to save cash on your trip. Book your package deal today on Expedia and earn savings of up to 15%*! It really is that simple! Explore our universal database of more than 400 partner airlines and 321,000 properties worldwide. Too many on there to pick from? Don't stress — we'll help you decide! Itinerary need some work? Montpellier holiday all organised but not sure what's on the cards when you reach there? Let us assist. You'll never have to worry about being bored in this enticing city. The Botanical Garden and Comedy Square will make sure you keep busy. The Fabre Museum and Mare Nostrum Aquarium are a few more fabulous sights that are worth a peek. Would you like to laugh, cry and gasp out loud in the space of a few hours? Take in a performance at Opera House and get lost in the breathtaking music and intense story lines. Visitors in this destination have a great range of options. Used as a house of public worship and spiritual meditation, Montpellier Cathedral is a notable theological landmark. That being said, you don't have to be the God-fearing type to pay a visit to this soothing space. Still got some time on your hands? It's time to get wild! Take the whole family to Montpellier Zoo and watch the kids' faces come alive as they rub shoulders with some of the wonders of the animal world. Finding comfy places to stay is crucial when it comes to organising cheap holidays or luxury getaways. 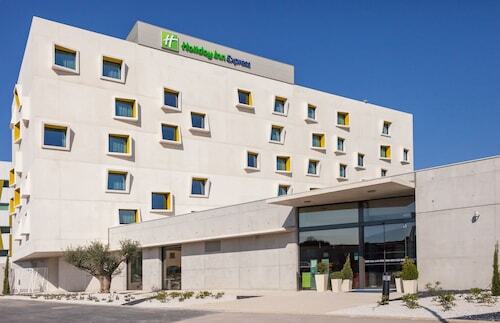 Luckily, Montpellier offers around 100 accommodations, so you'll be spoilt for choice. If you enjoy the finer things in life once in a while, why not spend a bit extra and pamper yourself at the Le Domaine de Verchant Relais & Châteaux (1 Boulevard Philippe Lamour) or the Pullman Montpellier Centre (1 Rue Des Pertuisanes)? If your holiday stash isn't as big as you thought it would be, the Appart'Hotel Eurociel Centre Comédie (1 avenue du Pont Juvénal) and the La Villa Nova (9 Rue Bomier) are a couple of lower-cost options. Got your hands on the plane tickets for your trip to Montpellier yet? When you arrive, prepare to step out into Montpellier - Mediterranean Airport (MPL). It's 4 miles (6 km) from the terminal to the heart of town. The oldest botanical garden in France contains thousands of plant species and trees that are hundreds of years old. One of France's leading opera houses is a Montpellier institution that hosts opera and classical music concerts by world-renowned composers. One of the largest pedestrianized squares in Europe is a great place to come for coffee, to see some opera and shop for food and fashion. Step inside an 18th-century mansion to explore hundreds of years’ worth of art from some of the world's leading painters and artistic movements. Behind the fortress-like façade of this medieval church is a collection of biblical artworks and a striking-looking organ from the 18th century. With thousands of exotic fish, a storm simulator, sharks and a tropical rainforest, this aquarium provides fascinating insights into marine life. Walk between the arches of the vast aqueduct near the moated water tower in this dazzling park celebrating the glory of a monarch. Relax in a vast esplanade by the River Lez that sits in a part of Montpellier characterized by grand architectural designs. A short stroll from the central Place de la Comédie, this park features a large pond, a pair of fountains and colorful floral arrangements. Located in Port Marianne, this hotel is 0.2 mi (0.3 km) from Mare Nostrum Aquarium and within 3 miles (5 km) of Place de la Comedie and Comedy Square. Planetarium Galileo and Vegapolis Ice Rink are also within 10 minutes. Place de France Tram Station is 7 minutes by foot and Odysseum Tram Station is 8 minutes. Located in Historic Centre, this hotel is steps away from National Orchestra of Montpellier, Comedy Square and Place de la Comedie. Hospital Lapeyronie is 2.3 mi (3.7 km) away. 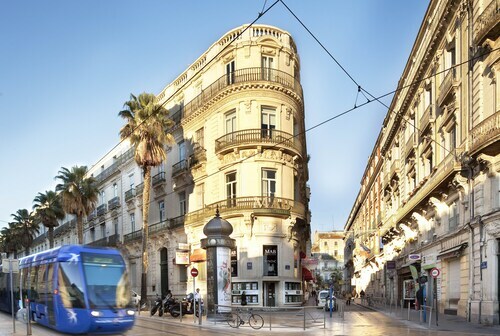 Comedie Tram Station is only a 2-minute walk and Montpellier Saint-Roch Station is 5 minutes. 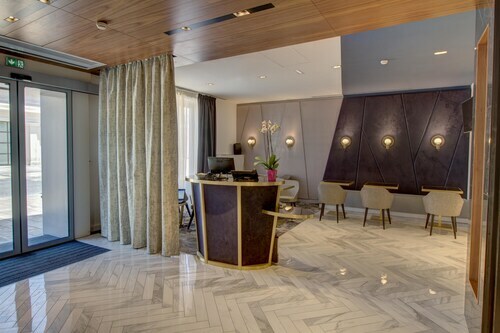 Situated in Lattes, this hotel is within 3 miles (5 km) of Montpellier Town Hall, Comedy Square and Place de la Comedie. Goolfy Mini-Golf and Esplanade de l'Europe are also within 3 miles (5 km). Situated in Mauguio, this hotel is within 1 mile (2 km) of Loc Karting and Centre Commercial Grand Sud. Kid's Fantazy and Chateau de la Mogere are also within 3 miles (5 km). 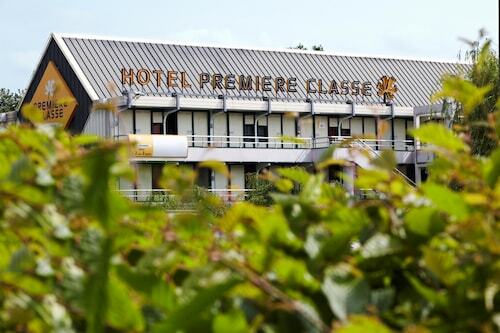 Located in Historic Centre, this hotel is within a 5-minute walk of National Orchestra of Montpellier and Comedy Square. Place de la Comedie and Hospital Lapeyronie are also within 3 miles (5 km). Comedie Tram Station and Hotel de Ville Tram Station are within a 5-minute walk. Located in Antigone, this residence is within a 15-minute walk of FNAC Montpellier, Place de la Comedie and Comedy Square. Hospital Lapeyronie is 2.8 mi (4.5 km) away. Leon Blum Tram Station is only a 2-minute walk and Antigone Tram Station is 4 minutes. 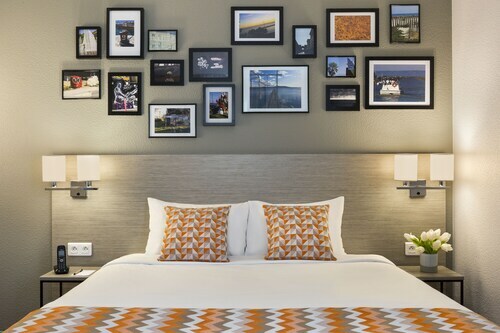 Situated in Sete, this hotel is within a 15-minute walk of Gulf of Lion and International Museum of Arts Modestes. Paul Valery Museum and Museum of the Sea are also within 1 mile (2 km). Sete Station is 17 minutes by foot. 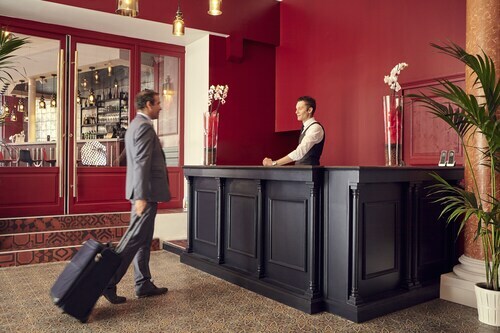 Located in Montpellier City-Centre, this hotel is within a 10-minute walk of Babotte's Tower, Comedy Square and Place de la Comedie. Hospital Lapeyronie is 2.5 mi (4 km) away. Montpellier Saint-Roch Station and Montpellier Saint-Roch Station are within a 2-minute walk.